This week I want to highlight an excellent book that I have just finished reading. It’s called “The Path Of Most Resistance” by John Turner. Although this book is only 126 pages, like many great books it makes up in valuable information what it lacks in length. As the sub-heading says, this book is loaded with everything one might need to achieve physical superiority. There is nothing which is of no use. Mr Turner shares his unique perspectives garnered from years of personal exploration. Those who take the time to read, absorb, and most importantly apply the lessons contained within its pages, will be rewarded (perhaps for the first time) with real results for their efforts. John Turner has just six words for those trying to improve their current physical condition – – take The Path of Most Resistance. Turner has received thousands of emails from all over the world from people who desperately want to try the original Nautilus machines and apply the Nautilus Training Principles to their exercise programs. If you are serious about reaching the limits of your individual potential for muscular size, strength, flexibility and metabolic condition, there is no easy road to take. 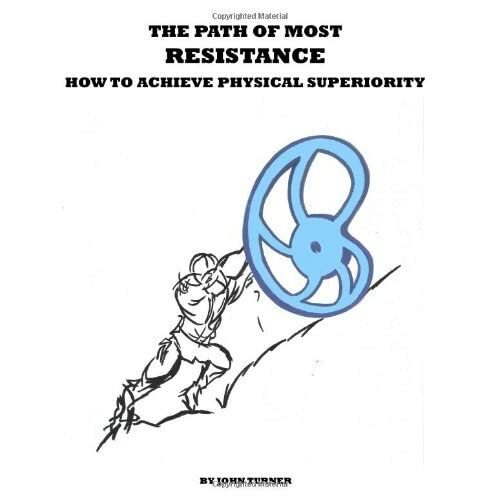 You could read hundreds of exercise books and thousands of bodybuilding magazines and not find the information contained in The Path of Most Resistance. For anyone who wants the absolute maximum results from their training, this is the one book you must own.